Liam Thornton’s piece makes reference to an article of mine, and I’d like to go back to the central idea I had in writing it in order to explain my position. In much of the analysis on the ‘Danish cartoons’ controversy, there was an implicit understanding that cartoons are for children. How could people be offended by something which is essentially harmless juvenile fun? Yet the history of cartoon satire tells otherwise; cartooning has had a long political history, according to one study beginning as far back as 1360 BC with an unflattering portrait of King Tutankhamen’s father. This noble tradition of political dissidence, or the cartoon as social protest, spread from 17th century Holland, and morphed into the editorial cartoon we have today. Cartooning has also, from an early point, engaged in racial intolerance. The Irish context has already been mentioned above, and the infamous Punch caricatures of hideous ape-faced Irish thugs led one 19th century commentator to wonder why some irate Celt didn’t conform to stereotype and club the cartoonist with his shillelagh. More recently Tintin in the Congo was banned in the UK for containing images of ‘hideous racial prejudice’, according to the Commission for Racial Equality. If you were to buy a copy now in a UK bookshop, it comes sealed in plastic with a warning that it portrays colonial stereotypes which are no longer relevant. It has also been transferred from the children’s sections of bookshops. Cartoon portrayals of religion are less common; political and racist cartoons flourished in Victorian England but there would have been no question of publishing attacks on Christianity. One interesting example on the website of the Political Cartoon Society tells of an early depiction of Mohammad showing deference to a then English cricket hero, Sir Jack Hobbs, in the Indian version of the Morning Post some 81 years ago. It caused outrage according to a Calcutta correspondent at the time, with Muslims ‘convulsed in rage’. Anti-Semitic cartoons were prevalent in the twentieth century, epitomised in infamous Nazi publications such as Die Sturmer with Jewish figures the victims of vicious ridicule and hatred, often through zoomorphic images such as a Jewish octopus straddling the world. By contrast cartoonists are also vulnerable to repression. In Saudi Arabia in 2007, two newspaper editors were sentenced to prison and hundreds of lashes for printing a comic strip which questioned the existence of God, while in Iran a cartoonist received a similar sentence for drawing a soccer player adjudged to resemble the late Ayatollah Khomeini. Democracies are also open to stamping out unwanted cartoons; two Spanish cartoonists were fined in 2007 for defaming the royal family, while in the US a satirical caricature of George Bush based on a Vietnam war photo, in which the former President was depicted holding a gun to his head which symbolised the Iraq war, prompted a visit to the offices of the LA Times by the US Secret Service. But the contemporary debate has raged around depictions of Mohammad, as referenced in South Park. The subsequent threats to Parker and Stone have been documented in the newspapers. The extent of freedom of expression protections in the US can be divined from the fact that there has been no immediate call for prosecution of the group Revolution Muslim who sent the animators a photo of the murdered Dutch film-maker Theo Van Gogh. In order for such a case to be taken, the prosecutor would have to prove incitement to violence. This is also the standard found in Article 20 of the International Covenant on Civil and Political Rights 1966. However the rest of the world does not exhibit such light hate speech laws, notably Europe. The subsequent admissibility decision in Kuhnen v. Germany (1986), similarly outlining a pamphleteer’s desire for German racial unity in the face of ‘bolshevists, Zionists, foreign workers’ etc., was rejected on the basis of Article 10 and Article 17, with Article 17 used as a guiding provision while making the decision under Article 10. Thus the interference in the Article 10(1) right was justified under Article 10(2), although the Commission had regard to Article 17. A series of French cases decisively shifted the ECHR approach to Article 17. In Lehideux and Isorni v. France (1998), the Court carved out a particular role for Article 17; Holocaust denial. The plaintiffs were prosecuted for glorifying the achievements of Phillippe Pétain in a Le Monde advertisement. France argued that the interference was justified under Article 17 and Article 10(2). The Court ruled that the offending document sometimes omitted important historical facts, ‘but does not belong to the category of clearly historical facts – such as the Holocaust – whose negation or revision would be removed from the protection of Article 10 by Article 17’. Since Lehideux, Article 17 is applied with strict scrutiny to cases of Holocaust denial only. Thus in Garaudy v. France (2003), the plaintiff was prosecuted for a book which wrote about the ‘myth of the Nuremberg trials’ and the ‘myth of the Holocaust’. The application was deemed inadmissible, as the intervention was held to be justified under Article 17. What is the significance of using Article 17 instead of Article 10? The result is an absence of a balancing process. Article 10 cases take the right to freedom of expression in Article 10(1), and weigh this against the public interests in Article 10(2). This is found for example in the Jersild v. Denmark (1996) case, in which a journalist was prosecuted for relaying the opinions of a group of racist youths known as the ‘Greenjackets’. While prosecution of the youths would have been justified under Article 10(2), prosecution of the journalist was not held to be necessary given the serious context of the piece, which was a relevant investigation into far-right movements in Denmark. This is a rare example of hate speech passing the admissibility stage and being upheld by the Court. There is no such balancing process under Article 17; speech is restricted solely because of its content. Consequently Europe exhibits a three-tiered approach to hate speech. At the top is Holocaust denial; it is severely restricted under Article 17, with no ‘balancing process’ taking place. In the middle is racist speech; it is protected under Article 10(1) but states are justified interfering with that protection provided they meet the criteria of Article 10(2). This necessitates a ‘balancing process’, seen in the Jersild case, although it should be noted that most instances of racist speech would not pass the admissibility stage. Finally there is religious intolerance, or religious defamation, seen in the Danish cartoons. If Denmark had decided to prosecute Jyllands Posten, would the magazine have succeeded in invoking their Article 10(1) right to freedom of expression? The answer would appear at present to be no, under past rulings on blasphemy such as the Liebeskonzil v. Austria (1982) decision, although unlike cases of racist speech, such religious cases will pass the admissibility stage. Also there are calls from influential commentators, for example Kevin Boyle, urging reform of European support for blasphemy prosecutions. ‘Even though… the fact that some of the cartoons were satirical caricatures of the Prophet Mohammad, and that as such, given the central role of Mohammad for Islam, they might imply ridicule of or express disdain for Muslims’ religious beliefs or worship in the sense protected by the blasphemy clause… a concrete interpretation and evaluation of the cartoons led the Public Prosecutor to the judgment that the cartoons did not, after all, constitute an infringement of the clause’. This extraordinary piece of reasoning did not feature at all in the debates, which took the view that Denmark was an open society which would never prosecute for a simple cartoon, even though they quite obviously constituted blasphemy and its laws couldn’t be clearer. I am not advocating that the cartoonists should have been prosecuted – I am only drawing attention to the fact that Europe’s laws in this area are murky, with a strong hint of double standards. Holocaust denial (protection of historical belief?) is pounced upon; attacking Muslim beliefs is something of a free-for-all despite unequivocal legal rules to the contrary in many European states. As such, Europe awaits the first real case on these issues at the regional level. I believe that this could potentially be provided by Geert Wilders, who is presently on trial in Holland for incitement and discrimination over his comments attacking Islam and his film, Fitna. If he is prosecuted, there will certainly be an ECHR appeal. It will come as a surprise to many commentators who imagine Europe to be a free space for all ideas however abhorrent, but on past rulings the Court will hold the prosecution necessary under Article 10(2). Not doing so would mark a major departure. This could happen, given the depth of feeling that a change is required. If Europe wishes to allow untrammelled criticism of Islam, it will need to reconsider other restrictions on hate speech, including blasphemy laws and Holocaust denial, in the interests of consistency. There cannot be too much of a disconnection between these cartoons and Muslims as a vulnerable minority in Europe and the US. The growing sense of being under attack, seen in the banning of the full Islamic veil in France, and the Swiss vote banning minarets (an outrageous violation of freedom of religion), is fuelling a sense of entrenched discrimination. The constant media crowing over Muslim reactions, seen as a self-fulfilling prophecy of the cartoons, seems disproportionate. I am an admirer of cartoonists, and appreciate the art and style of bandes dessinées (a far better descriptor than the English ‘comics’, which again has that misplaced sense of juvenilia). But the power of cartoons should not be underestimated, and just as we regard past racist stereotypes such as Tintin’s adventures in the Congo with distaste, it is possible that in the future, these attacks on Islam will be viewed with similar repulsion. The argument runs that religion is different from race as it is chosen rather than inherited; but for many people, religion is a primary source of identity, perhaps more so than their ethnicity. Their bewilderment (and I am talking about ordinary Muslims, not the extremists) in the present climate should at least be understood. Criticism of religion, like criticism of anything, is essential. But the cartoons have always been malevolent, produced in a climate of fear and discrimination against the Muslim minority. 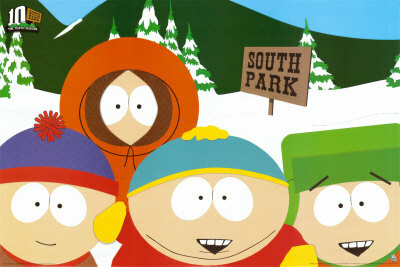 Should South Park censor itself? No, I don’t think so. But I also refuse to join those who are delighted to proclaim that this is another blow for free speech. It is not the job of cartoonists or other critics to validate that identity. Religion is an ideology like any other, and Islam a particularly damaging one. Why the Holy Cow (no pun intended). If it weren’t for criticism and even ridicule, our secular society might not even exist as we know it. Buying into another’s ideology and isolating it from criticism will not help anyone, least of all those attempting to reform Islam from within. To see the ban on headscarves and minarets as an attack on Islam, on the grounds that one is “just an item of clothing” and the other “just a building” ignores the realities that Turkey and Tunisia both have restrictions on Islamic dress in certain institutions. Fact is, attacking Muslim beliefs is NOT a “free-for-all” in the way attacks on, say, Christianity are. There are those that seek to insert ‘religion’ into a special category alongside gender and ethnicity as protected areas of discussion, but this should be strongly resisted. 1. Can I hear a bit more about Denmark’s blasphemy law as it applied to the cartoons case? So, for instance, is the law used very often? Has it been used in the case of blasphemy against other religions? What was the context of the decision not to prosecute? What are the obligations of the prosecutor to give reasons for a refusal to prosecute? 2. I wanted you to clarify for me what your central argument is from a normative perspective. It seems to me that you are writing about how the law on freedom of speech (a) has been presented in idealistic terms that disguise its political malleability particularly at the point of decisions to prosecute (b) interacts with broader social trends such as sustained essentialist criticisms of Islam in the public sphere. These are important points which must, I think, colour the way we understand our ‘norms’ and the shape they take when they meet practice. – Many of the essentialist stereotypes conjured up (often with skill, sometimes bluntly) in our public discourse about ‘Muslims’ seem to me to come very close to racialised speech. Muslims are not ‘a race’ but they have become racialised in the popular imagination. Yet, this sort of speech is essentially protected because Muslims are not ‘a race’. We have plenty of examples of groups in international law who are not protected from certain forms of discrimination because they are in the wrong sort of group or rather do not fit (or more accurately, are not permitted to be recognised as fitting) the available categories in international law – caste is one issue which comes to mind. This question, I think causes us to wonder what we are protecting by restrictions on free speech. And what is that thing we are protecting? With incitement to hatred law, we know what we’re protecting against – violence, danger, holocaust. But at the next level down, what would ‘defamation of religon protect’? You seem to suggest that the answer might involve questions of identity read together with power relations so that persons sharing a particular identity might be more in need of protection by law when the political winds were blowing strongly against them? Is this the case? – We must accept – as you do- that speech criticising religion is important and ought to be protected, just as other forms of political dissent ought to be protected. I don’t think, for example, that critique of the position of women under state-enforced shari’a or of the policies of Muslim political groups in the UK should be off the cards. And I would accept, even, that we would presume that speech of this kind is valuable and only shift from it in exceptional circumstances. But the question is about the line when what is obviously a criticism of the tenents of a religion becomes criticism of a religious group isn’t it, and in particular when that criticism has an impact on vulnerable individuals? If we do want to restrict certain forms of harmful speech about religion, how do we keep the division between doctrine (up for grabs) and rights-bearing individuals (sometimes not)? I think it’s a valuable division, but I’m not sure how it would hold, given that if we think about much speech about Islam in the public sphere, only the most sophisticated would categorically meet the test of ‘talking about doctrine, not membership’. – Won’t there be cases where permitting criticism of the belief (as opposed to the group or characteristics associated with the group) will negatively impact the believers in much the same way as say racist speech affects a racial grouping? In those cases, will the need to protect the right to criticise the belief always trump the effect on the believers? – When you talk about triumphalism, I think you’re right and it harks back to the ways in which our norms around freedom of speech (and indeed gender equality) are manipulated in the service of exclusionary politics. But does the apparent motivation behind a particular speech act count? And if so, how would we judge it? – Is law even the place for these issues to be worked out? It seems to me that what you’re touching on in terms of ethics of public, journalistic, political and artistic speech (and the these, of course, must be governed differently because of their very different purposes)is valuable. Our public figures should think about power relations when they engage in critique of religion and should think about identity while recognising that identity claims cannot be used to hamstring public debate around religion, especially where it intersects with other social concerns (as in the case of the niqab) and we should cultivate a sense of the value of critique of ideas. But does international law help or hinder this process? So where do you stand on these points? 3. I think you make a good point on belief. Not sure what I would say except to point towards the other option – loosening-up Europe’s approach to hate speech altogether and going the American route. I suppose my biggest problem is with the free speech brigade who refuse to recognise that we have multiple restrictions on racial and religious speech in Europe which seem to lend themselves to (at least the perception of) arbitrary application. Doing away with all of them, including all blasphemy laws, Holocaust denial, racist speech etc., might also be the way forward. 4. I believe the motivation behind speech is essential. Hate speech issues must distinguish the context – the Jersild case was about context and motivation, and was rightly decided as a violation of Article 10 because he was a journalist who did not intend to attack minorities in Denmark. Similarly politicians should be held to a higher standard (I’m thinking for example of the late Joerg Haider in Austria, who was expert at using what the EU called ‘ambiguous language’ to attack minority groups). Judging it is not straight-forward but then again it shouldn’t be, as these issues rarely are. 5. It is about much more than law of course. But international law is adding a strong voice through ECHR caselaw, Human Rights Committee rulings, UN special mechanisms, Nahimana case (‘media trial’) of the Rwanda tribunal, etc… I don’t necessarily agree with it all but freedom of expression is certainly at the centre of human rights protection (and a vehicle for the realisation of other rights), so it is important that these issues continue to receive prominence. Thanks! Great David. Will look it up.